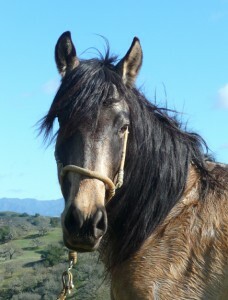 Tecolote: The Little Horse That Could Wins the 2011 Silver Nautilus Award! Tecolote: The Little Horse That Could by Sandy Nathan has won the 2011 Silver Nautilus Award for Children’s Nonfiction (Grades 1-6). “I’m terribly excited about this win,” says author Sandy Nathan. 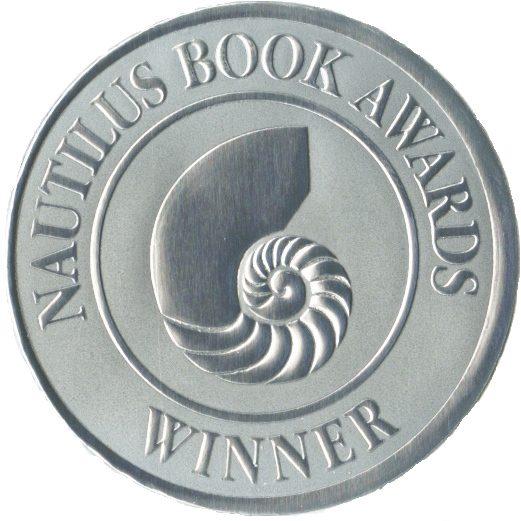 “The Nautilus Award means so much to me. It’s purpose––recognizing life-enhancing, life-changing literature and spoken art––aligns with my life’s purpose––producing books that enhance and change the lives of those around me. I couldn’t be happier. “ Tecolote’s win is especially meaningful. 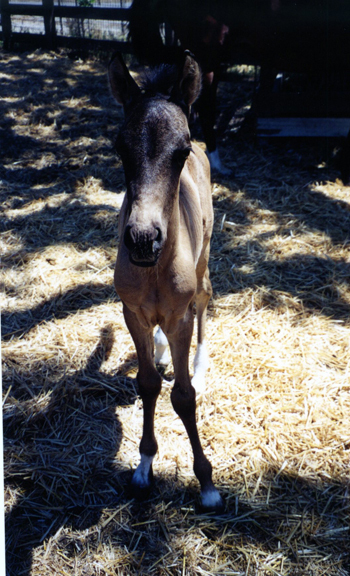 The little premature and soon-orphaned horse in the book grew up to be my horse. 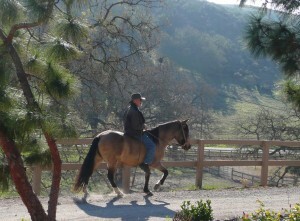 He’s the only horse we own who is reliable enough for me to ride. I’ve got a replaced knee, fused ankle and a couple of other physical dings that make me very cautious about getting on a horse. 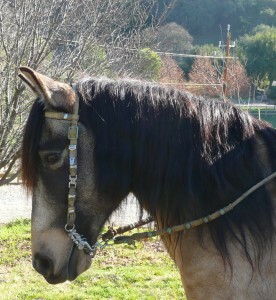 Tecolote is my boy. He takes care of me. “One of the things about horses that makes them so special is the way they bond with human beings. Or maybe it’s the way we bond with them. Whatever. Teco and I are bonded. That’s a sweet experience. What are the reviewers saying about Tecolote: The Little Horse That Could? Zippora Karz, author The Sugarless Plum: I absolutely loved this book! 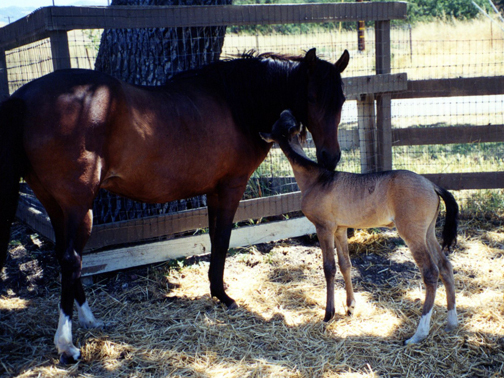 Through Tecolote’s journey we feel the love of a mother for her child, (horse for filly and colt), how to find friends, play with them, and create mischief as well. This is a story for any age. I cried and laughed and marveled at all the ways love can be expressed in our lives. 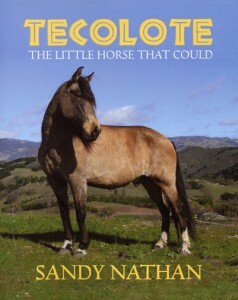 Tecolote: The Little Horse That Could is available on Sandy Nathan’s Web Site and on Amazon in print and Kindle forms. Tecolote as a paperback book. Tecolote as a Kindle book. 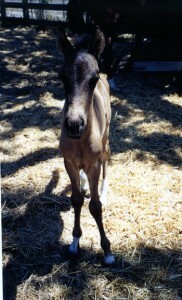 Tecolote is an adult horse. “On the other hand, you can download the Kindle version in a minute and be reading it. You can’t beat the price: 99 cents. I was very pleased at how the pictures came out in the Kindle book. Very clear, though black and white. 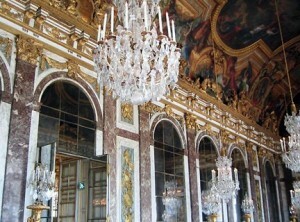 A TRUE MONSTER HOUSE: The Palace of Versailles was home to Actual Royalty. I’m illustrating this post with photos the prototypical Monster House, elegant in every way, full of pretension––I mean, if you think you’re God, you could live in this house with a straight face––and the best of everything. It differs from modern monster houses in that its real, way upscale, and conforms to the principles of design, listed down below. Only a few hours after posting my position statement on large houses and the contemporary practice of flashing every dime you’ve got, I went to a social function at a home that can be described as plu-perfect, and huge. A monster house, by size, anyways. Oops. I wandered around the edifice, marveling at the workmanship, the 3 ” thick marble counters, wood floors, plaster finishes, gorgeous fenestration (windows), views of the Pacific Ocean from every window. Sweeping panoramas of the City of Santa Barbara, offshore islands, gardens. Everything. This was the most beautiful home I’d ever seen, and a monster house. I’d never want to own it: I couldn’t afford the gardener, much less the utility bills. But, wow. And what a spiritual feeling about the place. Plus the owners were really nice, humble, kind people. Never underestimate the value of nice landscaping in increasing property values. Look what it did for Versailles! My cheeks burned and I felt that inevitable, “I blew it,” walking around that beautiful place. So what’s wrong with this picture? First off, my original mind set was that big equals evil. Big is just big. And wealth is OK. Better than OK. Where’s the wisdom in this experience? These are straight from the Guru Gita, an ancient Vedic text. Other philosophic systems will have different goals, but I like the simplicity of the four above. Dharma refers to living a spotless life by whatever moral system you espouse. Artha––well, we all know what wealth means. Pile it on. My mom had a great poster in her house: A southern mansion with the line, “I’ve been rich and I’ve been poor. Rich is better.” That’s easy. Kama––kama as in kama sutra. Pleasure. Better far better life goal than pain. Pain comes on its own. And Moksha––liberation. Means liberation from the wheel of life, attainable by union with God. 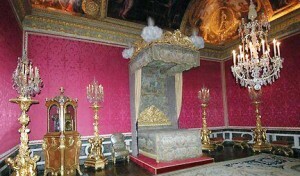 The King’s Bedroom at Versailles: With the right karma, you could sleep here. Of course, it didn’t do much for Louis XVI. The magnificent edifice I wandered into after my rant about monster houses was the fruit of a life well lived. The individuals owning the house had all four goals, in spades. The wealth one, artha, very obviously. And humility. 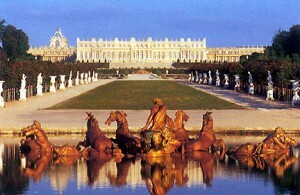 Versailles, Beautiful, Ornate, Over the Top. Sparked a revolution. And one other, which I forget. Let’s call it taste, or beauty. I’ll discuss those principles in a later post. Here’s a link to an article about the importance of beauty in book cover design. Says it very well: Lewis Agrell’s Article About Book Covers. Here I am, ready for Versailles. 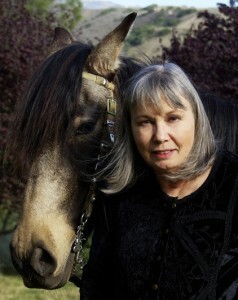 Sandy Nathan is the winner of seventeen national awards, in categories from memoir, to visionary fiction, to children’s nonfiction. And more. Two sequels to The Angel & the Brown-eyed Boy are in production with a late (very late) 2011 publication date, or early 2012. If you liked The Angel you’ll love Lady Grace and Sam & Emily. NUMENON: WINNER OF FOUR NATIONAL AWARDS––SO FAR! ISN’T IT TIME THAT YOU READ NUMENON? You can buy both of Sandy’s books for $29.95 with free shipping! These also will be signed by the author and inscribed to you or the recipient of the book. “I’ve been thrilled and shocked and grateful this spring as the book contests announced their winners. Numenon won two more national awards in prestigious contests. All the information about Numenon’s wins is below. I’d like to invite you to read my book. I spent years writing it and fine-tuning it until it said what it was supposed to say. More years getting it published. Now you can reap the fruit of my work and read my book at your leisure. “I’m hard at work rewriting, re-visioning, Mogollon, Numenon’s sequel. I think you’ll agree that the promise of Numenon is more than delivered in its sequel. “I appreciate all of you who have purchased Numenon and given me such wonderful reviews. Please let your friends know about Numenon if you’re so moved. We authors need a boost, too! In May 2009, Numenon won the 2009 SILVER NAUTILUS AWARD for INDIGENOUS/MULTICULTURAL FICTION. The Nautilus Award was established to “change the world one book at a time.” It is devoted to “Recognizing Books and Audio Books that Promote Spiritual Growth, Conscious Living, and Positive Social Change and stimulate the ‘imagination’ and inspire the reader to ‘new possibilities’ for a better world.” Previous Nautilus winners include: Deepak Chopra, M.D., Thich Nnat Hanh, Jean Houston, PhD., Eckhart Tolle, His Holiness the Dalai Lama, Andrew Weil, M.D. 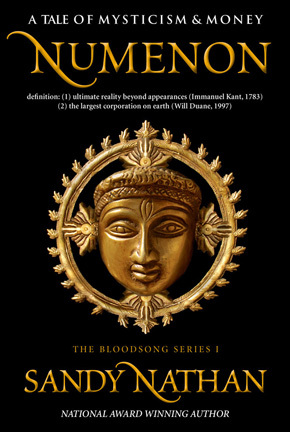 NUMENON has just received a Silver Medal in the 2009 IPPY Awards, claiming its fourth national award. 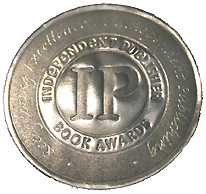 The “IPPY” Award is one of the oldest and largest book contests for independent presses. This year’s awards attracted 4,090 entries from throughout the U.S. and Canada, plus most English-speaking countries worldwide. Medal-winning books came from 44 U.S. states plus the District of Columbia, eight Canadian provinces, and six countries overseas. THE BEST BOOKS OF 2007 AWARD in VISIONARY FICTION, USA Book News. The Best Book Award is a large, prestigious contest entered by the major publishers as well as independent presses. THE 2007 NATIONAL INDIE EXCELLENCE AWARD in RELIGIOUS FICTION. The Indie Excellence contest stresses true excellence produced by independent presses. Buy Stepping Off the Edge for 99 cents! Kindle version is less than a buck! Stepping Off the Edge is a wild ride to sacred places. 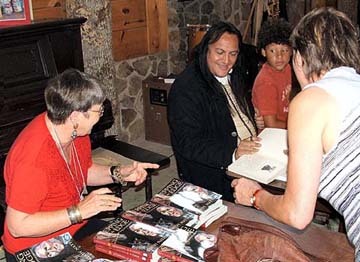 Includes an exclusive interview with Bill Miller, award winning Native musician, artist, & speaker. 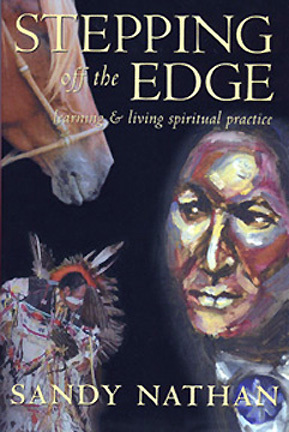 Now you can buy the Kindle edition of Sandy Nathan’s award-winning book, Stepping Off the Edge, for 99 cents! Vilasa Press offers the book at this great price for a limited time only. Click here and go to the Kindle store. The Kindle edition of Stepping Off the Edge is absolutely gorgeous: The Native American themed interior and cover converted to the Kindle format better than we hoped. All of Sandy Nathan’s pen and ink drawings are included and look beautiful. Join Sandy as she finds her roots in Missouri’s Ozarks, travels to Tennessee to a Native American retreat, and meets Bill Miller, multi-Grammy winning musician and artist. Lots more, including the meaning of the word “fault” to people from California. 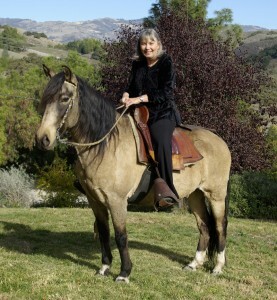 Come on a spiritual journey with an award winning author! STEPPING OFF THE EDGE WON SIX NATIONAL AWARDS! * National Indie Excellence Awards 2007: Finalist in THREE Categories: Memoir, Self Help, & Spirituality. When Sandy Nathan set out to write a book about her profound experience at the Gathering, a Native American spiritual retreat, little did she know it would guide her to chronicle a life of stepping off the edge. Again and again , she takes the risks needed for her soul’s growth and vividly presents her personal journey––one of growing into the courageous spiritual being she is. Sandy reminds us we all possess spiritual greatness: It is our birthright. By walking with Sandy along her path we get more than a glimpse of a person. We get a revealing and inspiring view of her life. 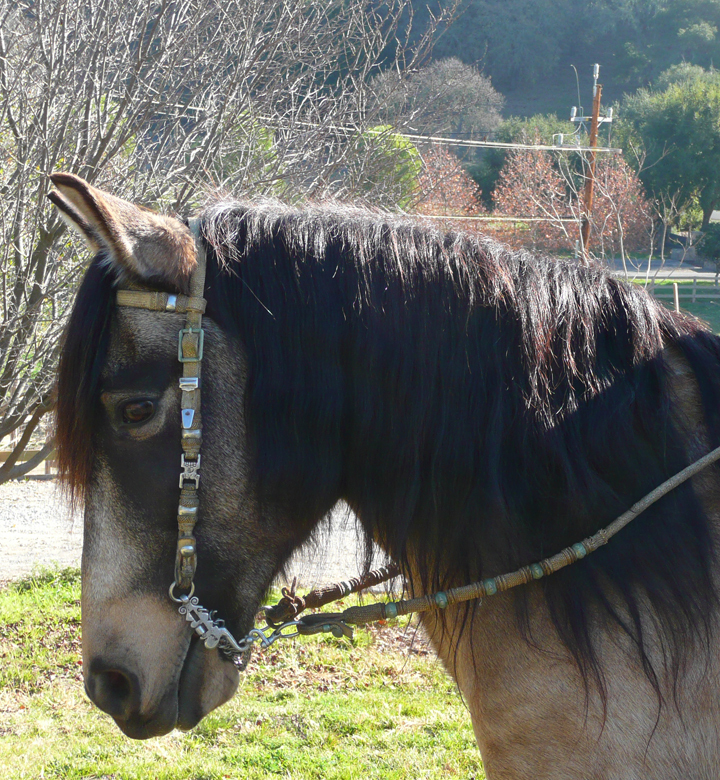 Her adventure and the understanding she adds as she writes help us use her experience to enhance out own development. This book does much more than tell about a life: It takes us by the hand (or sometimes by the nose) and leads us to the opportunity afforded by spiritual practice. And practice is the key word. Stepping Off the Edge is alive with information and inspiration. It is a book about doing. It’s more than a book that describes chocolate cake or even one that tells you how to make chocolate cake. It is a book that gets your mouth watering for chocolate cake and then lets you loose in the kitchen stocked with recipes and everything you need to make your own chocolate cake. With fudge frosting. And chocolate chips if you want them. In this fascinating narrative you will encounter the basics of prayer, meditation, worship, spiritual retreat, and how a life can become dedicated to the pursuit of experiencing the divine. You will even find how to domesticate your mind and make it an ally in your quest for inner knowledge. It is said that the path to self-awareness is a solitary one. Stepping Off the Edge opens you to the possibility that it can be fun, challenging and rewarding. WHAT DO THE CRITICS SAY?